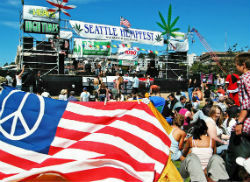 On August 17th was official opened the twenty-first Hempfest in Seattle, the biggest event in the marijuana industry! More than 300.000 persons attended what is now the biggest hemp fair in the USA. Many hemp products were on presentation and lectures were held. As the organizers describe it on their website, “Each year, we give birth to a beautiful, bouncing Seattle Hempfest. Each year her gestation is different, The City and Parks Departments remold her and force us into a model of constant redesign. It’s amazing how it almost becomes Hempfest from scratch each year. Not a year has gone by in the past decade where they didn’t impede us with a construction project or other restriction that threatens our existence.” And this year was no exception! Ballot measures to legalize marijuana are sprinting toward the polls in three Western states in November. Marijuana supporters say Washington’s vote on Initiative 502 is important to maintain national momentum on an issue that is beginning to see steady gains in popular support. But the pro-marijuana community here is deeply divided over the measure. Beneficiaries of the state’s medical marijuana law fear that legalizing and regulating pot use would subject pot patients to potential arrest under the measure’s strict impaired-driving provisions.